Make more money driving for Uber: Here comes part 3 of my secret tips and tricks how to be more effective as an Uber (or Lyft) driver. If you haven’t read part 1 and part 2 of my insights into making more money, I highly recommend taking a peak at these posts. If you’re too lazy (which I understand ;)), I’ll briefly recap for you: In part one and part two of Make More Money Driving for Uber I talked about two very important principles that help you achieve your goal of making more $$. Before we get to these principles, we have to define our goal a bit more. What does it even mean? Simply put, our goal is to make more money per hour we drive. Because the additional money you make has to end up in your pocket, not in your tank. Sound good? The first principle is to think of your income as an Uber driver in terms of an hourly wage. Why? Because it’ll give you a clear entity to measure your success and how effective you are. After all, making more money and spending it all on gas and tires isn’t really making more. Right? The second principle is distance over time. How do you apply that? Miles make more money than minutes. Being stuck in traffic (even though the meter is running) is not as effective as for example driving in early morning or late evening traffic when you can just zoom around. You can find more details on this in part 2. You can use Uber for example when Surge Pricing is active, or when Lyft is slow. Your chances of getting your next passengers sooner increase (and you’re reducing your just-waiting-around time). When Uber is slow, there might be more demand for Lyft. If you’re driving full time and lots of hours, Lyft has an incentive in place called Power Driver Bonus. It was introduced in 2014 to reward their most dependable drivers. What are the requirements to get the bonus? The Lyft Power Driver Bonus requires drivers to maintain an acceptance rate of at least 90% as well as completing a certain amount of rides per week. The acceptance rate is calculated by the number of accepted and completed rides (either dropping passenger off or marking it ‘no show’) in relation to the total ride requests a driver receives. Starting on March 7 2016 (earlier in San Francisco, San Diego and Salt Lake City) your car has to be 2011 or newer to be eligible for the Power Driver Bonus. Starting January 25 2016 (earlier in certain places) Lyft will be counting rides instead of driven hours as before. The new minimum completed rides per week requirements vary for different cities. There are two levels for the Power Driver Bonus (each depending on a certain amount of rides that vary by city). Depending on how many rides you complete, Lyft will then either only take 10% out of your total pay (instead of the normal 20%), or you’ll get to keep all of what you make. The demand for rides goes up during special events. A special event will pull in a certain amount of drivers because of the increased demand (and likely Surge Pricing). This also means that the surrounding areas have less drivers than usual, which also increases the need for Uber and Lyft drivers. Make More Money: What are Your Strategies? The strategies from part 1, 2 and 3 of Make More Money Driving for Uber do really work. I’ve put them to the test. I also tested other strategies that didn’t work for me. Now it’s up to you to test them and experiment with them. Leave a comment, I’d love to hear how they work for you (also if they don’t work) or if you have different strategies. 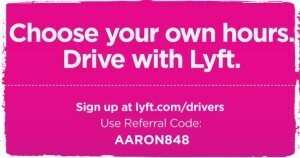 Lyft for a cash bonus! Is it necessary to have an unlimited data plan if you’re working full-time? (Especially if you’re doing both Lyft and Uber?) I have seen that Uber may use about 2G by itself, but I haven’t seen a reference to phone requirements for working so many hours. Question: I have driven with Uber for 6 months and recently signed up for Lyft, though haven’t done any Lyft rides yet. If you have both apps open, what if you get a ride request on both at the same time? I signed up with Uber about 4 months ago. I am just starting now. How do I get the sign up bonus? It’s not necessary to have an unlimited data plan (in case if you are not using Facebook, Skype and other social media sites) although it will be really helpful if you have an unlimited data plan!